This weekend….almost over and it’s so sad! They go by way too quickly!!!!! 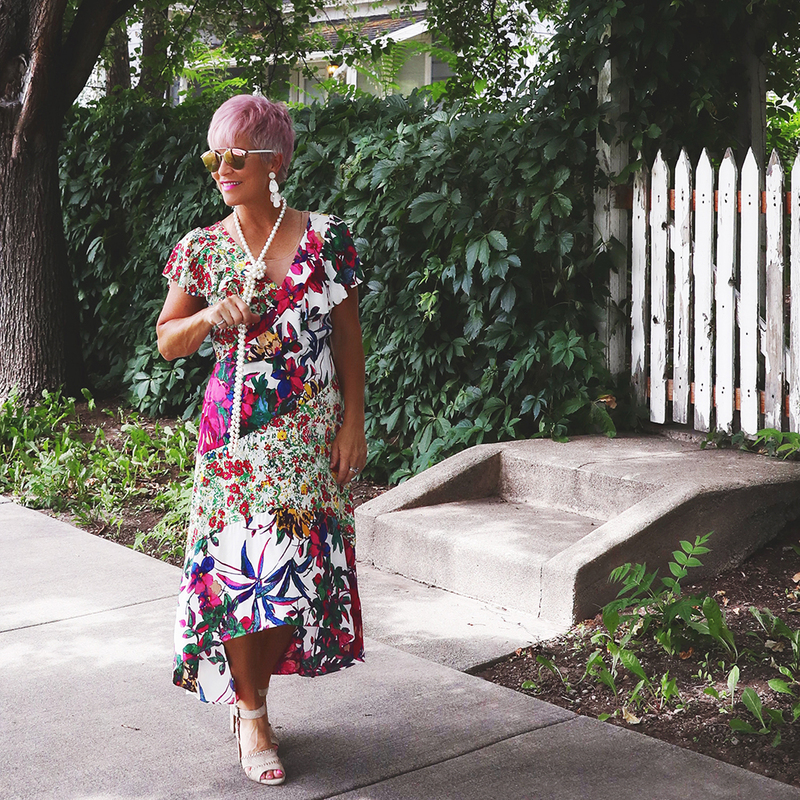 But before it’s over, I wanted to tell you about my LOVE for Tracy Reese dresses! You know I’m a dress kind of girl, and TR dresses are always SO GOOD! I’m wearing one here that sold out at Anthropologie before you could blink your eyes! I’m pretty sure I’ve always LOVED florals. Some say they look granny-ish, but I’ve just never thought that! It seems that it’s better going simple on the accessories when you have a busy floral going on. 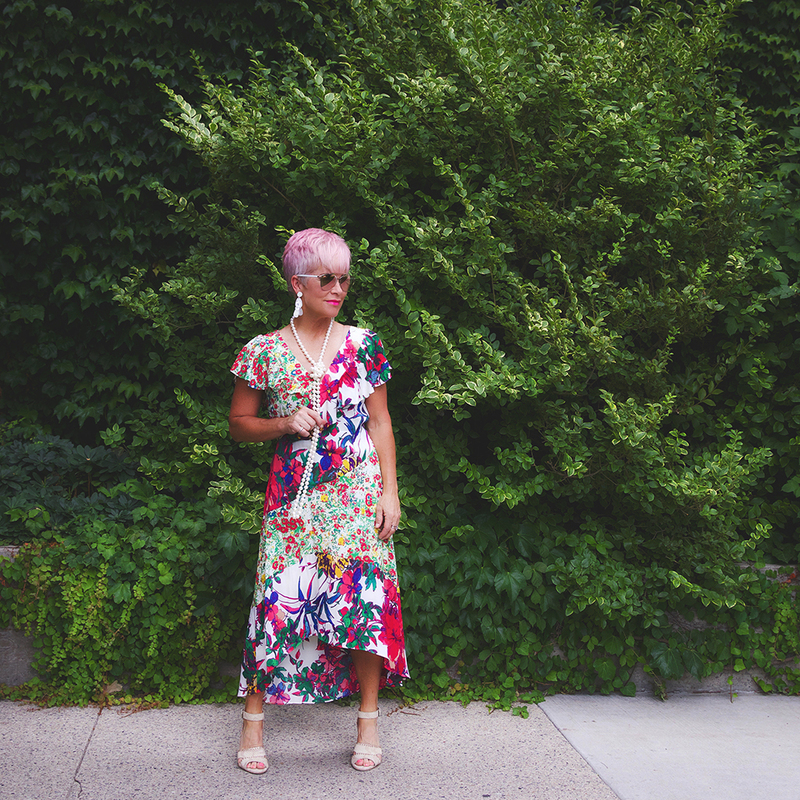 When styling a floral, especially a dress, I think minimal or simple is best! Usually a floral is busy enough to stand on its own! I LOVE my pearls, that are at least fifteen years old! They add a timeless and classic look to the dress! I’ve linked several Tracy Reese dresses for you here to take a look at. You can always count on the quality being excellent. Some are even on sale! Take a peek and see what you think!!! On a sidetone….this passed weekend I had the honor of being interviewed by Hannah of Trendeing.com. Her and her partner Janice, came all the way from San Francisco to do a video taped interview with me and a photo shoot. Trendeing is a platform you can go to, to read fun and engaging content that empowers self-love and healthy living. Their keywords are ENTERTAIN, EDUCATE, and EMPOWER. I can’t wait to share more with you!!! I’m not going to say I wasn’t nervous, because I was. They both quickly put me at ease, and I was able to talk about Chic Over 50 and how it all began, what my goals are, and everything in-between. But as I was thinking about what I said, after we were all finished, I realized just how much my blog means to me. I have been given an incredible platform to share and help other women, and women of ALL AGES I might add! It’s crazy to me how it has evolved, and how it is helping women all throughout the world! When I first began, I thought it would be all about fashion, but it has grown in to something much more than that! I’ll be posting the video and pictures very soon. Have a great week everyone….and thank you always for your support!